Transportation systems can and should be a powerful tool to help people access opportunity, drive economic development, improve health and safety, and build the civic and social capital that bind communities together. And when artists team up with transportation professionals at a project’s outset, their collaboration can lead to new, creative, and more comprehensive solutions to today’s transportation challenges. This process known as creative placemaking is happening in communities across the country and transportation professionals are eager to know, what are the key trends and best practices? 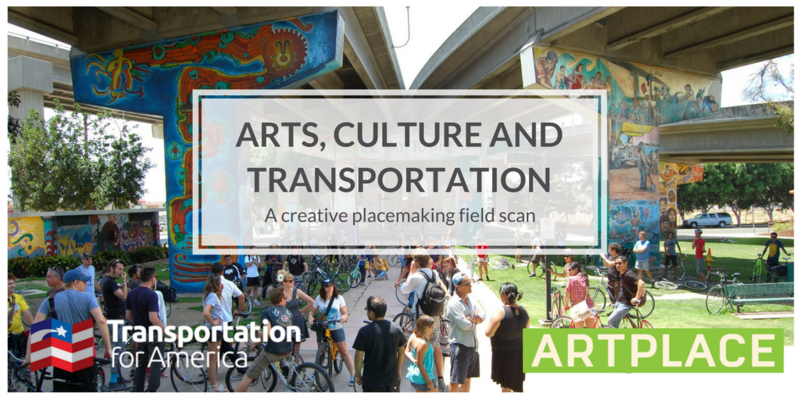 Introducing Arts, Culture and Transportation: A Creative Placemaking Field Scan, a rigorous national examination of creative placemaking in the transportation planning process. Released today by Transportation for America in partnership with ArtPlace America, this new resource identifies ways that transportation professionals can integrate artists to deliver transportation projects more smoothly, improve safety, and build community support. In addition to transportation professionals, this new resource is designed for artists and other arts and cultural practitioners. The field scan aims to help these two audiences develop a shared language and set of mutual goals, so that communities will benefit from these powerful, cross-sector synergies.